Board certification in plastic surgery: Insist on it. Did you know that, in Mississippi, any healthcare professional, even one not trained in plastic surgery, can be licensed to administer facial injectables? 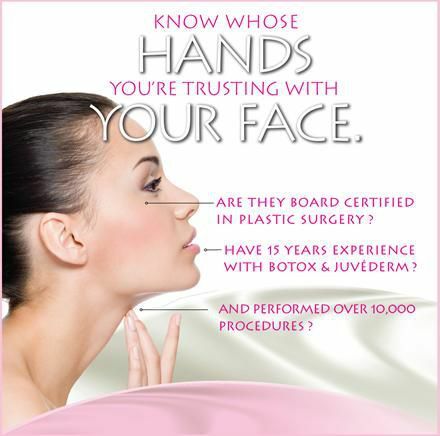 Many doctors are not board-certified plastic surgeons. Worse, many practitioners do not even have medical degrees. Why take the risk when it comes to your face? Would you ask someone at your day spa to check your eyesight or hearing? Always ask for a rigorously trained plastic surgeon. Does the practitioner have more than 15 years of experience with Botox & Juvéderm ? Has the person performed well over 10,000 procedures? Dr. Runnels is not only board-certified, but can answer "yes" to the questions listed above. Moreover, he is in the top 1% of physicians nationwide offering the above procedures. With a visit to the Runnels Center or SKIN the Spa, you leave the care of your face in the best of hands.